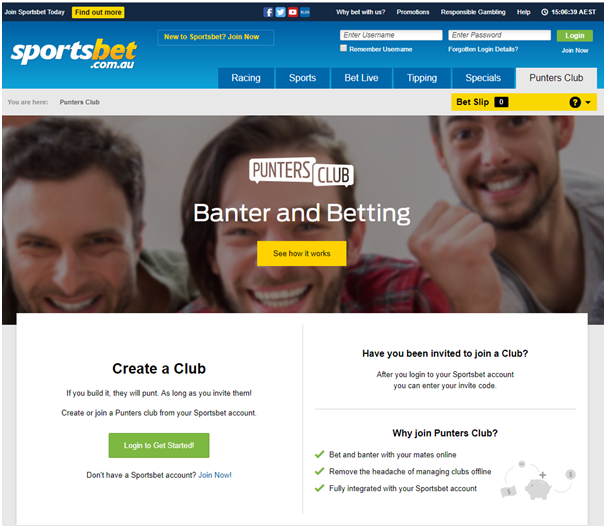 Home / News / What is Sportsbet punters club and how to create one? Many online bookies have their own club for punters to join. Such type of punters club allow you to create a single betting account for you and your friends. When you join any online bookie you will find such club offers on their sites or you can even ask the help support team for such offer. You need to be a member which means you need to register yourself at the online sportbook or horse racing booking site and open your betting account to get the privilege of such club membership. Here find such punters club at famous Aussie friendly bookie called Sportsbet.com.au. and know how it works. How to create a Punters Club at SportsBet? 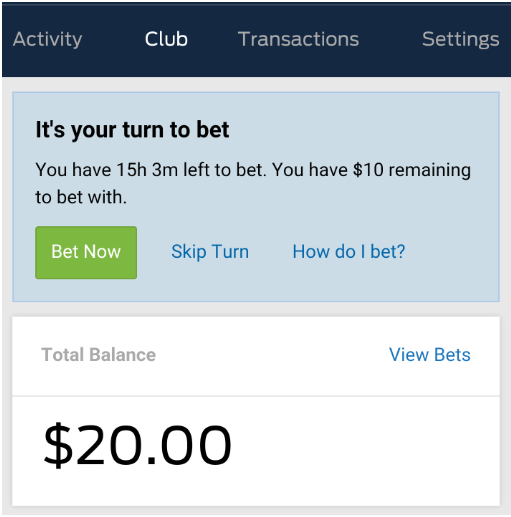 First you need to have an active betting account at Sportsbet.com.au to create a Punters Club for a single, purpose-built group account to which you can invite anyone else who has signed up with Sportsbet. Then you need to log in to Sportsbet.com.au or the Sportsbet mobile app. When you have done that, open the ‘Punters Club’ tab and hit the green button that says ‘Create Club’. 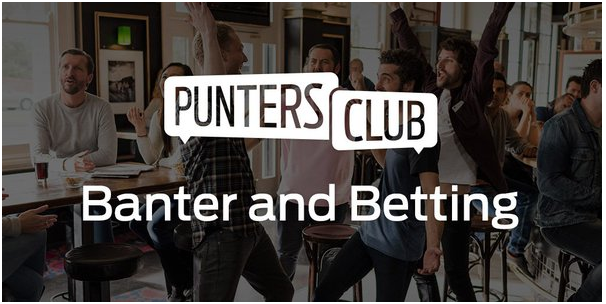 Existing Sportsbet customers can create a new Punters Club and invite their friends to join. Simply set the rules, activate the Club and you’re away. You can give the new club a title and pick your personal user nickname and get with the betting rules. Then you can adjust a number of elements, including how much each member is required to contribute, how often the punter’s club plays and what happens with the winnings after each round. Like you can decide that each person must put in $20 per round, each turn changes on a weekly basis and that all winnings are set aside. Also you can send out the invites to your friends. You can do this either via email or SMS – just type in your mate’s address or mobile number and send. Each invitee will receive a message with a special code for your club, and all they have to do is log in to their own Sportsbet account, head to the ‘Punters Club’ section and enter the code to join. Take turns placing Bets and see the winners roll in. You can transfer your Club Winnings to your personal Sportsbet account and Withdraw like you normally do. 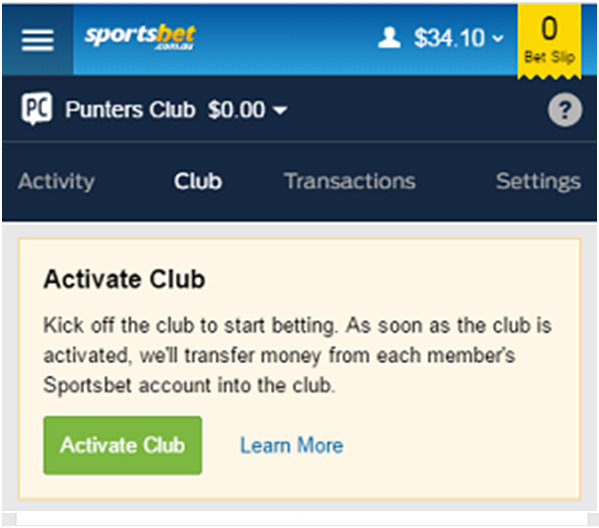 Note that Sportsbet will activate the Punters Club, by clicking ‘Activate Club’ at the top of your Punters Club homepage. 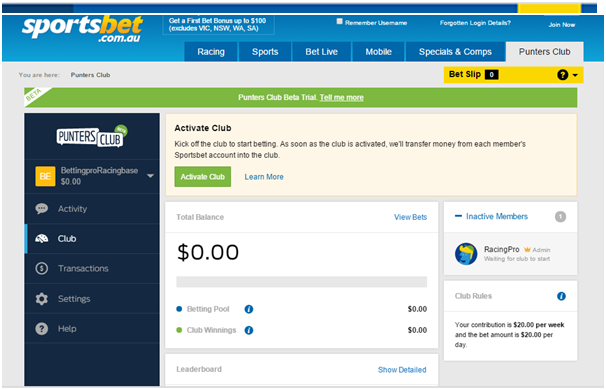 You can only activate a Club if: you have at least 2 members in your Punters Club and the two members have enough funds in their personal Sportsbet account to contribute to the Punters Club. Members who do not have enough funds will remain inactive until they can Deposit from their personal account. The amount you contribute in a weekly contribution club will change depending on the time left in the contribution period and betting turn. You can still contribute to a Weekly club even if you don’t have enough funds in your personal Sportsbet account. If there is enough money in your share of winnings, your contribution will be taken from your winnings and you will remain active in the Club. 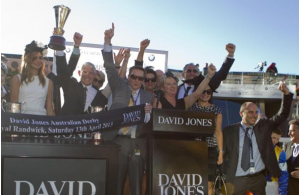 How are the winnings calculated in Punters Club? Your Winnings are based on how much your Contributed to the Punters Club. If you entered a Club after activation then the amount you contributed will be less. This means that your Winnings will be based on when you entered the Club. You are only eligible for Winnings from the point you joined the Club. Note that if your Punters Club was created before 30th of May 2017, your club will be under legacy rules where you set contribution settings and rules. Also if your Punters Club was created after the 30th of May 2017, all members contribute once and members can bet at any time. You can’t change the rules or create betting rules in a new Punters Club. How to place a bet with your Punters Club membership? It is all simple to bet with your Punters Club. To place your wagers, go to the Punters Club dashboard hit the ‘Bet Now’ button. The rest is just simple as you make any other Sportsbet wager with your PC or mobile. You can go through the many thousands of sports and horse racing on offer and enter your selections. When you have filled your bet slip and set your stakes, make sure to select your Punters Club in the toggle box that asks ‘Which account are you betting from?’ before confirming your wagers. To know that it is your turn to bet next at the club, the Punters Club sends SMS reminders to whomever is next in line, so there is never any excuse for anyone missing their go. Just make sure you have enough funds in your personal Sportsbet account to cover the pool contribution at the beginning of each round. There is an activity wall on your club dashboard where your club’s betting activity is automatically recorded and posted and every member can see exactly what is happening and stay in the loop. This is also ‘banter central’, where you can post comments and call out any punter who is letting the team down. On the Club rankings tab each player’s bet results and ROI percentages are updated and displayed meaning you can see exactly how well or how poorly each member has spent the group’s money. You can manage your club online on your PC or with sportsbet mobile app. Click here to create your Punters Club at Sportsbet now.